Each of us has a unique footprint. Our feet help us to stand tall and they are our connection to the Earth. Our ecological footprint is a shorthand way of describing the unique impact we all make on the Earth through our choices and actions. Footprint Cottage, our new home and garden farm will help us to tread more lightly upon the Earth. We hope that by making conscious and ethical decisions about as many aspects of our lives as possible and by living as simply as we can, we will leave a minimal footprint. We are doing what we can to ensure that our grandchildren can enjoy flourishing and fruitful lives on a planet that remains bountiful and beautiful. We would like to acknowledge that the land where we live is part of the traditional country of the Kaurna people. We pay our respect to them and their Elders and Ancestors. We celebrate their traditional way of life as a great example of small-footprint living. We are Jason and Susan, known to most people as Jay and Sue. We started building houses in the 1970’s and since then we have built 2 houses and renovated a third house! We built our first house almost entirely ourselves except for some plumbing, the footings, electrical work and kitchen cabinets. In those days it was much easier to be owner-builders! The house is still standing and much loved by its present owners who have lived there for some decades. 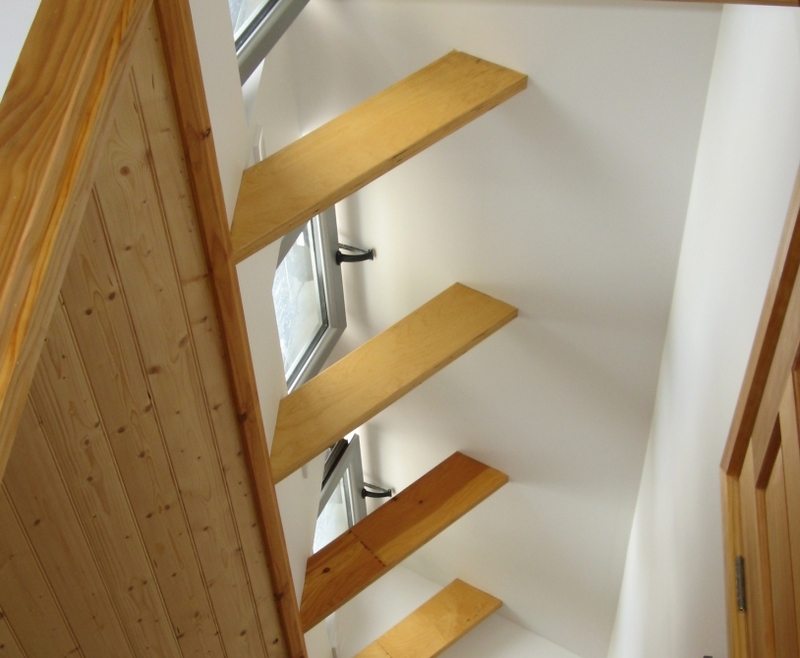 We built our second house over 15 years ago and we incorporated many sustainable features such as north-facing double-glazed windows, rammed earth, environmentally-friendly building materials and solar panels. It was a lovely house to live in and we enjoyed sharing it with many visitors over four Sustainable House Day open days. However we were finding our land difficult to care for and we fortunately found a young family who wanted to take over the care of this beautiful land and house. Professionally we have worked in the health and education sectors and are now (sort-of) retired. We have been amateur builders most of our adult lives. Jay is a great handyman and Sue spends all her spare time in the garden. We also love spending time with family particularly our grandchildren and being part of our local community. The floor plan of our house reflects a traditional settlers’ cottage layout with a central front door and rooms on either side. The roof is steeply pitched with space for rooms in the loft. The house is a rectangle with its long sides facing north and south. To the west is a covered deck which is accessed from the living area. The house is around 170 square metres including the useable upstairs space and deck. The living area has high ceilings to the roof space so that there is extra light from the clerestory windows. To the north there are large windows to capture winter sunshine for heating. These windows have vine covered pergolas for extra shading in summer. The windows on the south side are small and positioned to allow cooling breezes to enter the house in summer. There are windows in the east and west gable ends. On the south there are 2 skillion windows in the roof. Beneath the house we have a cellar and under the deck are 2 large rain-water tanks which give us most of the water for the house and garden. 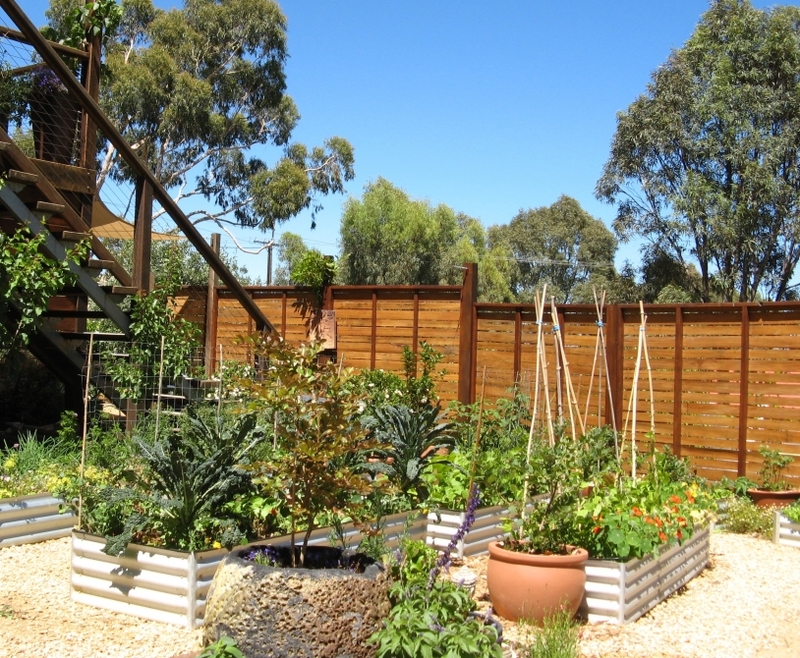 A grey-water system situated under the deck will provide supplementary water for the garden. Thermal mass is provided by a polished concrete floor and internal rammed earth walls. The external walls are a mixture of very well-insulated rendered eco-board, mini-orb Colorbond and sustainable timber. 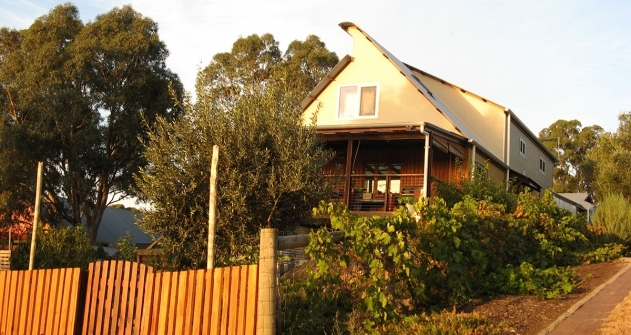 Solar panels are positioned on the north side of the roof which is light coloured Colorbond. We hope this house will enable us to generate all our own electricity, as well as return excess to the grid, and supply all our water needs including enough to grow most of our fruit and vegetables. We are using sustainable, recycled and environmentally-friendly building materials where possible. We are creating a beautiful house that is welcoming and homely and that is a pleasure to live in. We believe that one of the main ways to reduce our ecological footprint is by growing as much of our food as we can. We have chosen the term ‘garden farming’ to describe what we are aiming to do. We think that both organic and bio-dynamic gardening are the most sustainable methods of agriculture and that we can all help to create an abundant and resilient future by growing our own food using these methods of garden farming. Our farm is based on the Permaculture philosophy of Caring for the Earth, Caring for People and Sharing Fairly. For us this means working with nature by the careful stewardship of our land and bio-region. It means nurturing and nourishing ourselves and those around us as well as actively promoting the well-being of our local community and other communities both locally and globally, limiting consumption and fairly distributing resources whilst celebrating the abundance of the natural world. 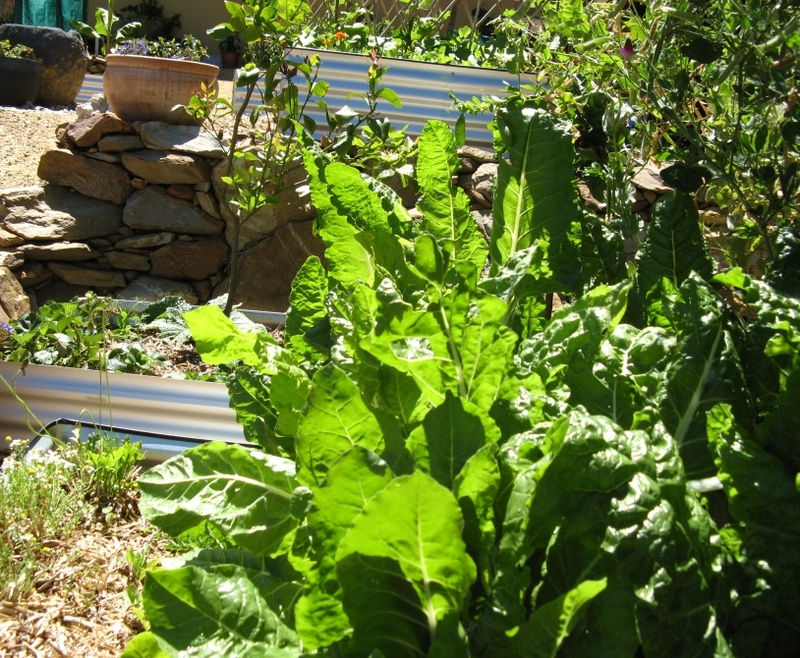 Permaculture is a holistic design system that integrates the house, garden and its occupants. We believe that by ethical, sustainable living and land use, balancing production and consumption, using appropriate technologies, and minimal use of resources such as energy and water, communities are empowered to creatively respond to the challenges of climate change, energy uncertainty and economic disruption. We are enjoying the challenge of creating a new sustainable home and garden but we know that not everyone wants to do the same. However we do think that we can do many things to make our homes more sustainable, grow organic food, change the way energy and water is used and significantly reduce waste. By taking small steps to make positive changes, we can all reduce our ecological footprint and learn to live lightly on the planet. Over the years we have learnt a lot about environmentally friendly building materials, planning and building houses, use of energy and water, zero waste living, healthy homes and urban farming. We are still striving to put in place all the knowledge we have acquired by means of many small steps. We believe that the best way to help others is by ‘walking the talk’. We love sharing our knowledge and experience with others and are planning to run workshops, tours and open days in the near future. If you would like to attend one of these events please contact us. Sue also has a Permaculture Design Certificate and can help with planning and designing a Permaculture-based garden. We invite you to join us on this ecological adventure. Together we can work on the changes we all need to make to save our environment. We love a quote from the I Ching Book of Changes…A journey of a thousand miles starts with a single step! And we plan to run tours of the house and garden on the first Saturday afternoon of each month. Please book ahead via the contact below. Interested in seasonal updates or upcoming events?